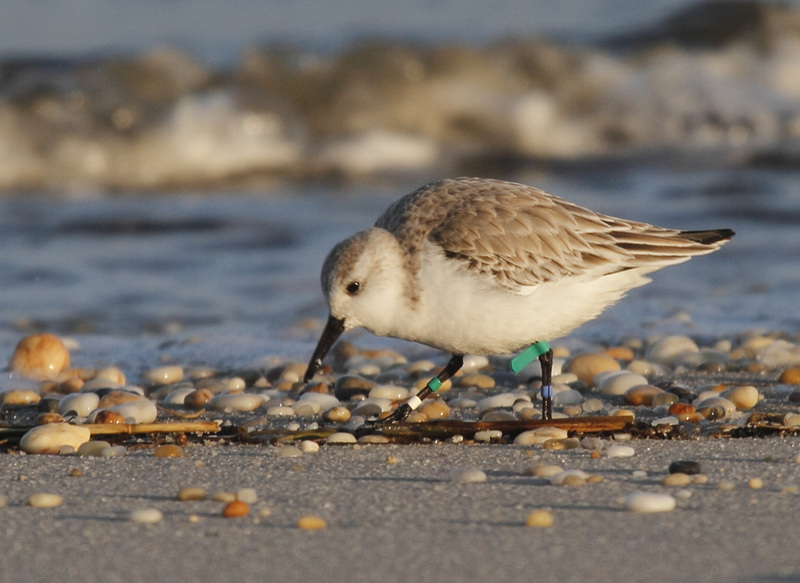 There are many banded shorebirds running around the world these days. 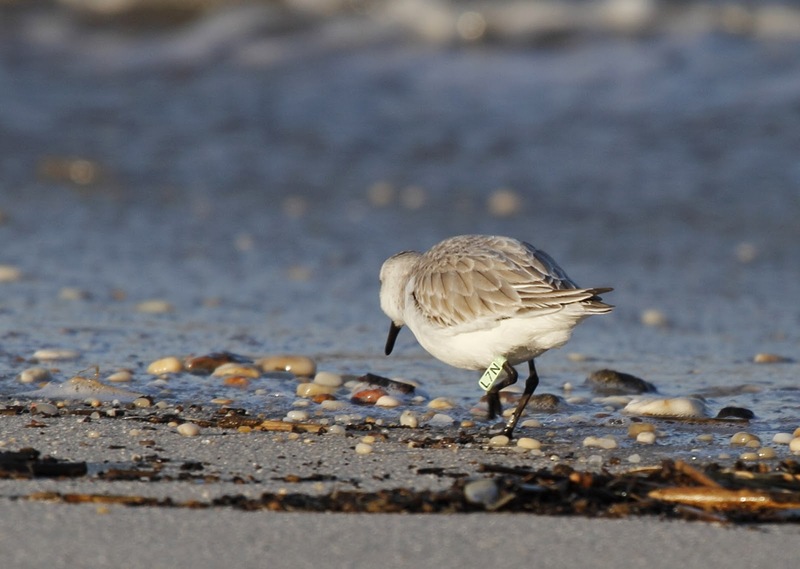 You know that I take part in the banding process in spring along the Delaware Bayshore and track sightings of banded birds throughout the year. 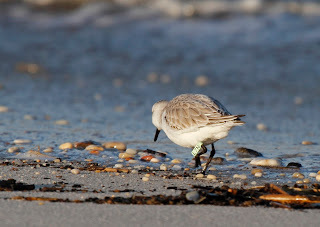 I found 3 banded Sanderling in the Villas on Monday morning which was pretty cool since I only saw a total of 20 birds. It is also cool that these birds manage to eek out a living in NJ in the dead of winter. The bands usually look like this. This is L7N. 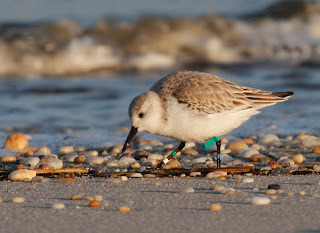 Jeannine, the data coordinator for bandedbirds.org sent me some interesting information about this bird "Pretty interesting that FL(L7N) using both Atlantic and Bayshore beaches during winter." I think the birds are going to the Atlantic ocean beaches when the bay is frozen, which is was last month when it was brutally cold. 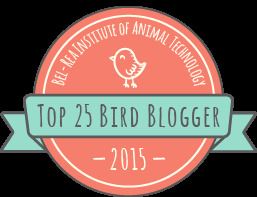 But occassionally, we get nutty looking tags like the bird below. The flag has no number/letter combination and both legs have multiple colored bands. Jeannine, the data coordinator for bandedbirds.org sent me some interesting information about this bird below: "the bird is a dark green flag cohort from NJ 2001. That year they put two bands on the lower right to denote the week in the spring season. So this bird was banded sometime from May 29 to June 4. Might be a fun one to post on Celebrate DelBay page due to age and time of year seen on a Bayshore beach." That makes this bird at least 12 years old! I had no idea that they lived that long. This guy has been to the Villas for more years than I have. I scan the shorebirds every time I see them on the beach hoping to get a banded or flagged bird. I think Jeannine likes the fact that I report from the Villas since everyone else seems to go to Stone Harbor and other, sexier beaches. I like my beach and apparently, so does L7N and the 12 year old. Do you want me to post on Celebrate Delaware Bay Facebook page for you? When you find a bird as old as I am, then I'll be impressed.